Who isn’t looking for a little piece of heaven? I don’t think there are many people who aren’t. This month, The Challenge brings you Heaven, right into your home. There are quite a lot of heaven-inspired lovelies just waiting for you, starting today, for this round. The heavenly living room set above from Cleo Design gives you everything you need to make heaven your home-away-from-home, including your choice of two views you can add behind the drapes (in case your window looks out on a neighbour whose idea of decorating is Early Second Life Bling or you are creating the illusion of a window out of a solid wall, like I did). Puffy cloud lamps, a soft, cushiony sofa with an adorable pillow and singles & couples poses, a pouf, the curtains and a romantic vase with roses are all part of this little piece of heaven. 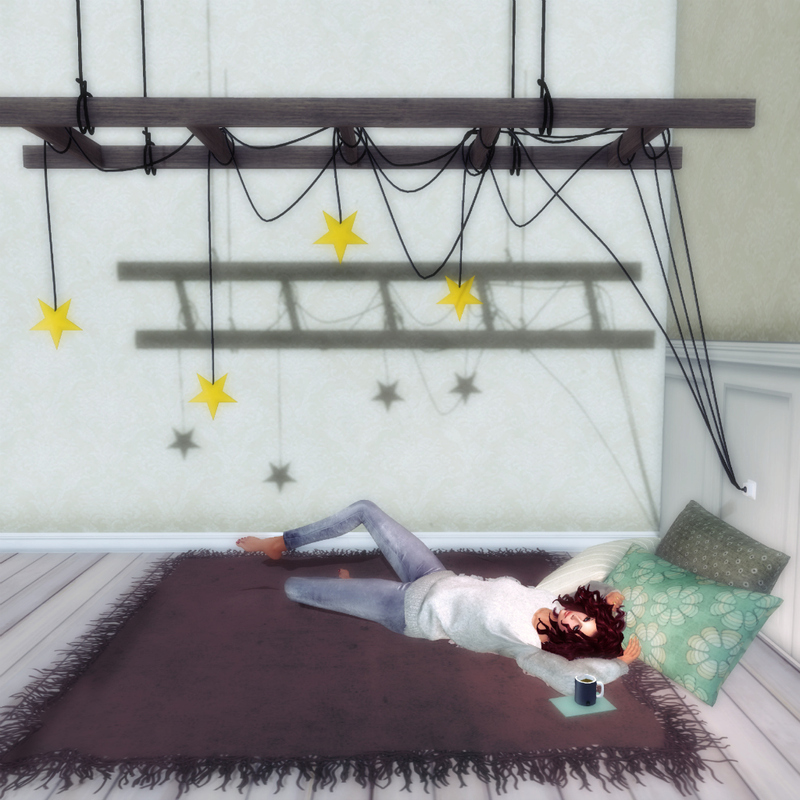 But in case you need a little more, Kuro has this sweet hanging ladder with dimmable stars, comfy cushions and even a cup of tea to inspire your heavenly dreams. Don’t let this simple pile of pillows fool you; it has three texture choices and about a kazillion poses included (singles and cuddles). Tuck up in a cozy corner and you can climb your way to the stars. I will be bringing you more heaven-inspired goodies from The Challenge in the coming days…as soon as I manage to pull myself up off the floor and finish some more pictures. In the meantime, you can visit The Challenge blog to see more delightful designs for this round.